Sri Lankan food. If you dip your finger into a local cooking pot you might be surprised by some strange flavours. Located right in the middle of the big shipping lanes of the ancient world, this spice-rich island has attracted many peoples to its beautiful shores. Sri lankan culinary art reflects the traditions of these various cultures. Most hotels here offer a wide variety of excellent oriental and western cuisine. 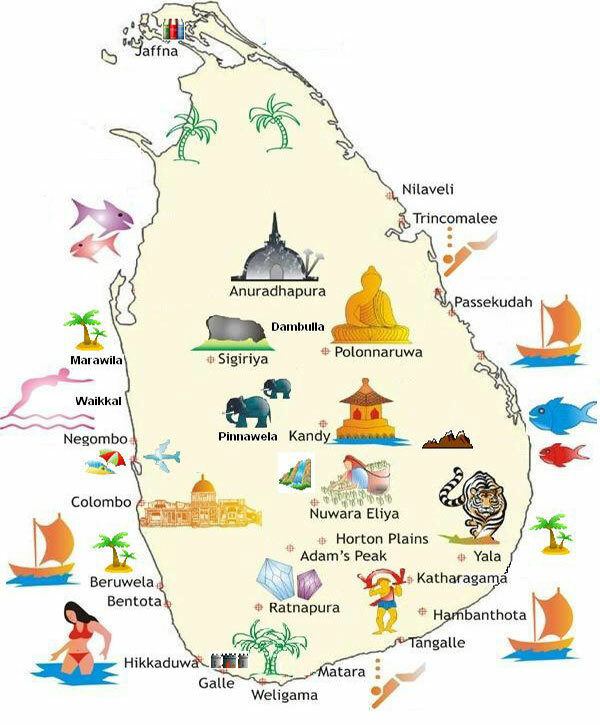 There are restaurants specialising in Chinese, Korean, Japanese, Spanish, Italian, Swiss and German food while some specialise in Sri lankan cooking. Try the lamprais no, they not the stuffed eels the Greeks drool over, but a Dutch variation of the rice and curry theme. Rice boiled in stock and a selection of dry curries are wrapped in a banana leaf and baked, to enhance the flavour. If you still have room for dessert after all that, go for a delicious dessert of curd topped with treacle. Or try Watalappam, a rich pudding made with jiggery, fudge from the Kitul palm treacle. If you're battling the bulge, you can still choose from a mouthwatering range of fresh fruits that will really give you a feel of the tropics. Try perennials like papaya, pineapple, several varieties of mango, passion fruit, and over a dozen varieties of bananas. Or go for the unusual pearly white mangosteen in its purple husk. Rambutan, Sapodilla, Soursap, Guava, Beli, Varaka and durian. Tambili (king coconut) dont just ask for fruit juice. Tambili (king coconut juice) drunk straight from the golden fruit, the delicate Kurumba, the crushed pink ice of watermelon juice, passion fruit juice, orange, pineapple, papaya. The two traditional Sri lankan drinks that cheer and very easily inebriate, are Arrack and Toddy. Toddy is the fermenting sap of the coconut flower. Arrack is the distilled essence of toddy. VSOA(very special old arrack) ,7 years arrack, and double distilled arrack are served in most hotels, but the best toddy is found at wayside taverns. Getting the tree to produce toddy is a specialised operation performed by people known as toddy tappers. Your typical toddy tapper will have as many as 100 trees in his territory, and his daily routine involves tightroping from the top of one tree to another on shaky ropeways to remove full buckets of toddy, lower them to the ground and replace them with empty buckets. with a soft-drink mixer arrack is very pleasant.